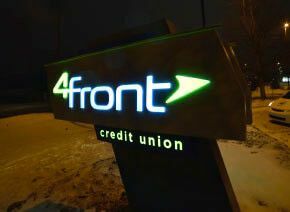 In late 2014, Members Credit Union and Bay Winds Federal Credit Union merged into a single entity under a new name: 4Front Credit Union. Fourteen branch offices widely distributed across Michigan’s northern Lower Peninsula would have to be rebranded – and quickly, given the financial institution’s 90-day goal. This objective was complicated by two factors. All 14 locations were unique, requiring custom solutions for each. What’s more, the bulk of the rebranding effort would need to be accomplished in Michigan’s coldest and most inhospitable month: February. 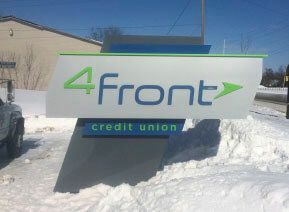 Knowing that collaboration was key along with comprehensive capabilities, 4Front Credit Union sought a locally based, full-service signage and graphic solutions provider. The resource needed to be expert in the design and installation of LED (light-emitting diode) signage – the client’s preference for illuminated signs at all branches. Given the different building styles and site plans, the selected provider would have to maintain multi-location consistency with design variations that best fit each location’s architecture and site constraints. In addition, the project required a partner resourceful enough to obtain construction permits in no fewer than 11 different municipalities – each with varying approval requirements and signage restrictions. They would, of course, also be accomplished with installations in severe weather conditions. 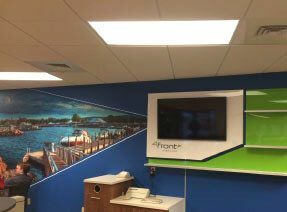 Image360 brought to the project a number of plusses – among them a creative focus on multi-dimensional elements and modern shapes that best complemented 4Front Credit Union’s new look. Due to the design of the new roadside LED signs, all-new footings were required. Because of the time constraints, below-freezing temperatures and prevalent frost line, Image360 proposed pre-cast footings with anchor bolts. Another innovative solution? To underscore the newly renamed financial institution’s ties to the community, Image360 designed ATM wraps with local images instantly recognizable to its 64,000 members. The bottom line? 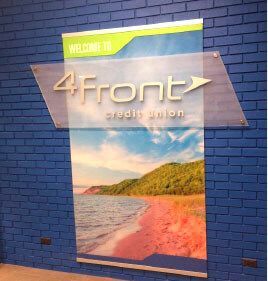 Image360 met 4Front Credit Union’s aggressive deadline for design, permitting, fabrication and installation—all while satisfying their need for signage and graphics that established their new brand and welcomed their many members. In fact, the financial institution was so pleased by Image360's effort that they recently commissioned them to address interior rebranding at each branch – where they are now at work installing new signage, wall graphics and custom displays.